1. Both candidates got the memo that viewers (and voters) have had enough of the hyper-argumentative tone of the past debates, and the result was a kinder, gentler conversation. That's right — for all but a few minutes, tonight's debate was downright civil. 2. Since this debate focused (or at least, was supposed to focus) on foreign policy, the first half was dry — a given, since the candidates are closely aligned on this front. 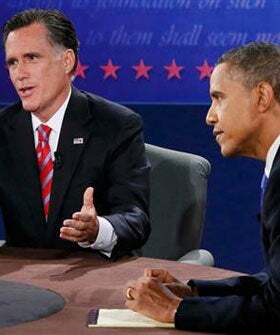 In fact, much of the conversation revolved around President Obama and Governor Romney — gasp! — agreeing with each other on issues such as ousting Mubarak, drones, a deadline for ending the war in Afghanistan, and treating Syria as a wait-and-see situation. 3. In his first one-liner of the night, Obama said to Romney: "You seem to want to import the foreign policies of the 1980s, the social policies of the 1950s, and the economic policies of the 1920s." It was a wonky zing, touching on the Dems' portrayal of Romney as old-fashioned. 4. In the non-answer heard 'round the world, Romney advised moderator Bob Schieffer to "come on our website" when pressed about fiscal policies. And naturally, the Twitterverse went wild with this link on one end, and the argument that you can't sum up the plan in two minutes, on the other. 5. In what will surely spawn a thousand memes, Obama dinged Romney's comment on a reduced Navy. "We also have fewer horses and bayonets, because the nature of our military’s changed. We have these things called aircraft carriers, where planes land on them. We have these ships that go underwater, nuclear submarines." It was Obama's most sarcastic remark of any of the debates so far, and a sign that the president was ready to get aggressive. 6. Schieffer was a pro at moderating this debate, toeing the line between gentle and authoritative, able to cut off candidates purposefully and swiftly without making them feel slighted. Except when he slipped and said "Obama's bin Laden." Oops. 7. And in the wrap-up to a relatively dry (alright, we'll say it — almost boring) debate, Schieffer left viewers with the words of his mom: "Go vote. It makes you feel big and strong." And we couldn't agree more.